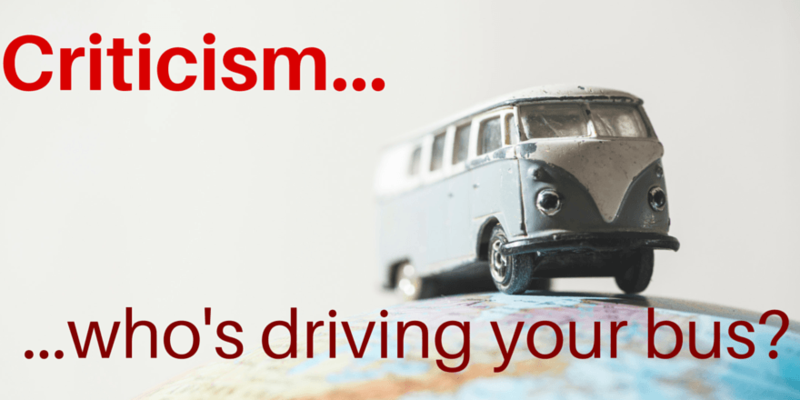 Unfair criticism: who's driving your bus? I was in one of the supermarkets where I regularly shop. As I waited in the queue I noticed that the young woman at the checkout (let's call her Carol) was not her in her normal bright and cheerful mood. When my turn came I greeted her "how are you?" to which she replied "Oh, I'm OK - if nasty customers didn't get me down!" There were others waiting behind me in the queue and we didn't have time for a long chat. Whether or not the advice was of any value I'll probably never know. She had brightened up quite a bit by the end of our brief interaction as she scanned the goods and I put them into the bag. My guess is that her brighter demeanour resulted less from my profound comments and more from being listened to and receiving positive attention! Carol wasn't weak or vulnerable because she responded to criticism in that way - I think we all fall for it from time to time. It's unrealistic to expect never to be hurt, however momentarily, by unwarranted and unjust criticism. The thing is, when you fall for it you are no longer 'driving your own bus'. Your critic is doing the driving - driving your mood. When I respond with hurt or anger or hurt to comments from Jack or Jill or John then my mood is being influenced by them - often long after they have moved on and forgotten about me (this is similar to the theme in the 'Leave it by the river' article). Some of us even dwell on such thoughts for days or years or decades afterwards. Often in the wee small hours of the morning!! Jack or Jill or John, our antagonists, are sound asleep having forgotten all about us. But here I am, or you are, lying there mentally and emotionally re-running the event. Imagining all the things we could have said. All the ways we could have responded and getting more and more emotionally worked up - producing huge amounts of adrenaline which further ensures we lose hours of sleep. While they have forgotten about us and are sound asleep…! This is not a very useful way to run one's brain. Why does criticism press our buttons? ... a common reason is that we tend to hang on to a rather touching childhood belief in universal fairness. It is part of the mythology about life that is often foisted on young children by well-meaning adults i.e. that life is fair. And we hang on to this belief because we never get round to questioning it and because so many books and movies perpetuate this myth. And we then become astounded and disappointed and hurt and even angry when others do not play this game. When they treat us in a manner that is, by our standards, unjust. Unfair. Not right. Like I said it is an irrational belief. The first thing to do when criticised, whether you believe it to be fair or unfair, is to be curious about ! What are they aiming to achieve with this somment? How is their life right now - happy or unhappy? What are they getting from this? What do they want from me right now? What's common to these questions is that they focus on the other person rather than on you. They are driven by curiosity about the other person. And, as we explore in our NLP Core Skills course, curiosity is a great emotional self-defence attitude to develop. 2. Is it really about you? Are they really attacking you personally or is it simply that you happen to be available and look like you won't hit back? This is especially the case if you work in the 'service sector' - if you deal with the general public in the public services, in shops, restaurants, cafes, bars, etc. You are perceived as 'fair game' because they know it's unlikely that you can retaliate in kind without endangering your job. Criticising people who cannot retaliate is cheap. 3. Are they simply unhappy? This is another issue related to 'Who's problem is it?' They may be venting their spleen on you because they are frustrated with something else. In other words are they simply unhappy and frustrated with their lives? And chances are that they are! (See this article, too, Pity Petty People). Stop. Before you react, that is. Take a good look at them. Do they look really like happy people? Would a genuinely happy person act in that manner? If you were really happy or were deeply in love with someone or had just heard great news would you be able to behave as they had just done? Chances are that you would not. 4. You or your behaviour? Distinguish between criticism of your behaviour and criticism of your personality. If I work at a supermarket checkout and, in your opinion, I am working too slow or am taking too long in chatting with customer before you in the queue then maybe, just maybe, you can comment on my behaviour. Even if it is a cheap and nasty thing to do - knowing I cannot retaliate. However this is quite different from commenting on my personality or self worth. Saying that I am a stupid or slow or inconsiderate 'person' is a quite different issue to saying that I 'behave' in a stupid or slow or inconsiderate manner! My behaviour and my self worth are two different levels of the NLP Logical Levels Model. 5. Do you really care that much? Who's opinion matters to you? When we are criticised it is normally at the level of our self worth (see previous point). So how is it that we even give this a second thought? How it is that when a person says that you are stupid or evil or unpleasant that you take this to heart? How does this person know how you really are? How come we even give such a warped or narrow opinion a second thought? Or give such a person a second thought? (Actually, it's often because we do not have a high opinion of ourselves - but that's for another article). Think about this. If you have a really good opinion of yourself and I criticise you what will you do? It is likely that you will wonder what sort of warped view I have developed and what is wrong with me that I should be behaving in such a manner. Because your opinion of yourself is secure you are more likely to wonder about 'me' and my perceptions than about yourself - which is where the focus should be in such a situation. Let's say that, just after this person had criticised or insulted you, someone who's view you respected had quietly told you that the critic was actually a certified 'unstable' person who was on 'day release' from a mental institution. How would you now feel about what they had said to you or about you? It's likely that you'd think 'If they're mentally unstable it doesn't matter what they say about me'. Yet, in reality, we usually do give weight to how just about anybody treats us. Because we decide that it does matter. Because we rate their opinion of us higher than our own opinion of ourselves. 6. Are they playing one-upmanship? A lot of people who criticise and attempt to undermine others are doing so in order to feel superior to their 'victim'. They have such low self esteem that they need a constant reassurance that they are better than you. Sadly, we often encounter such behaviour from those we spend a lot of time with, such as family, friends or colleagues. 7. Don't give them a reward! If someone criticises you and you do not rise to the bait they don't get a reward for their behaviour. Yet they need your response in order to get a feeling of power or satisfaction! By not retaliating or responding in any way you deny them this satisfaction. Behaviours that are not rewarded soon fade away. Or the unhappy person looks for a more cooperative victim. Decide that you're not going to let them win - by refusing to dwell upon their action. And every time that you find yourself beginning to think of what they did or said remind yourself “I don't need to do this to myself”. You don't have to take their views on board. Yes, it is likely it you will have an initial response of anger or hurt. But you don't need to carry on feeding this emotion. It's your choice whether or not you continue dwelling on it and building it up in your mind. If you do dwell on it it's likely to upset the rest of your day or even the rest of your week. Now it's likely that we cannot stop negative thoughts from popping into our heads - and provoking feelings. 9. Fairness is not absolute. Remind yourself of this reality. And the reality that people have different views of what is right or wrong, what is appropriate or inappropriate. Their version of fairness may differ considerably from yours. The fact that you take 'your' fairness for granted and that it is shared by people who you know doesn't mean it is 'true' - just that it is popular. Because something is self-evident to you doesn't mean that someone else will not have quite diametrically opposed views. Nor does it mean that you are right, necessarily. If their view of fairness is so different - so off-the-wall from yours - then do you really need to have anything to do with them? And remember that feeling angry or resentful towards someone connects you to them - because you still think about them. If someone is so different in their views perhaps indifference might work better for you? This one comes up a lot in my anger management workshops. And the answer is you cannot stop them 'getting away with it' unless they have broken the law of the land. You or I do not have the right nor the authority nor even the ability to change the behaviour of another adult human being. If someone chooses to be gratuitously offensive we cannot stop them. What we can do is choose to spend little or no time in their presence. For many this is a bitter pill to swallow because they have spent a large part of their lives trying to avoid doing so! We believe in 'right' and 'truth' and 'justice' and 'fairness'. We believe that the good guy/gal always wins. This doesn't happen, of course so we seek consolation by identifying with the heroes in the revenge or put-the-world-to-right-movies of Charles Bronson, Clint Eastwood's Dirty Harry, Stallone, and so on. 11. Any truth in it? Lastly, and when you have calmed yourself down, you may want to consider if the comments on your behaviour might in any way be justified - even if they do not have a right to make the comment. This is based on the NLP Reframing idea that there is something to be learned from any situation - however 'negative' or unpleasant it may be. There is a strange and quaint saying often used by judges in British courts to the effect that "any reasonable man might conclude" something or other or come to a particular conclusion. (And, yes, they do say "reasonable man" and not "reasonable person"). Try applying this somewhat questionable test to the situation in which you are being criticised. Is it possible that a reasonable person might find 'something' to criticise in your behaviour? Or is it simply the unhappy person's strange perception.